Esalen Institute reopens to the public Friday. Seventy-five guests are attending the first workshop since Esalen closed nearly six months ago. General Manager Terence Gilbey stayed at Esalen during the 6-month closure. He was one of 21 employees who volunteered to do so to take care of the place. Esalen has its own garden and farm. When Esalen was landlocked, those who decided to stay depended on food from both. A work glove hangs on a railing. It's a sign of all the prep work employees have done to get ready for the reopen. Esalen is perched on the Pacific Ocean. You can hear the waves rolling in from anywhere on the property. The lodge, home to the kitchen and dining room, is surrounded by succulents. Hot springs are located on the southernmost part of Esalen. The baths at the hot springs overlook the Pacific Ocean. A place where art workshops are held. Where movement classes are held. Areas of Big Sur that have been nearly impossible to access are opening up. Adding to the growing list of businesses and State Parks, you can now visit the Esalen Institute. It reopened Friday after the longest closure in its history. As Jon Karst sweeps away dried leaves and cobwebs in front of the main door into the lodge at the Esalen Institute, the Pacific Ocean rumbles in the background. Esalen sits along Highway 1 about an hour south of Monterey. Karst ticks off the jobs he wants to get done. “I’d probably like to mow again to make sure the lawns are looking nice,” Karst said. He’s on Esalen’s grounds crew. He hasn’t gotten around to sweeping and mowing over the past six months. He’s been focusing on storm damage cleanup, like chopping fallen trees for firewood and weeding. “We had so much rain, so then there were all these weeds that were just growing everywhere too,” said Karst. Record rains this winter left the non-profit retreat center landlocked. To the north it was cut off because of the downed Pfeiffer Canyon Bridge. To the south landslides further isolated this retreat center. In early February, most of the employees were evacuated by helicopter. Karst was one of the 21 who volunteered to stay and take care of the place. Another was General Manager Terence Gilbey. “This is a very large piece of land to be kind of held by such few people. So it was kind of strange, pretty lonely at times,” Gilbey said. Wearing faded jeans and a black T-shirt, Gibley gave me a tour of Esalen. We walk along a gravel pathway from the southernmost part of the property, where hot springs overlook the ocean. He also takes me across a grassy lawn to a colorful garden. During the closure, the small staff that remained on site depended on the garden and Esalen’s farm. Gilbey is looking forward to seeing guests fill this space again. “This is a land that has rested now for five-plus months. And on Friday night we’re probably going to see about 75 people come over the hill and join us for the first workshop,” Gilbey said. 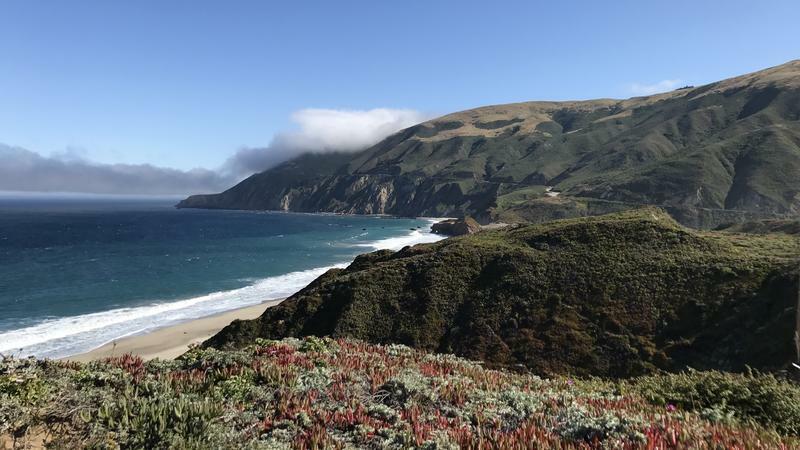 This weekend’s workshop is called “Igniting the Power of Your Empathy and Intuition.” It aligns with Esalen’s new approach developed over this near six month closure. Before, workshops focused on the individual. Now they’re focusing on the collective. “The collective human potential, which is you know, what can we do together to transform the world and the place we exist in,” Gilbey said. Natural disasters have struck Esalen before, but this one led to its longest closure. The institute survived on donations from around the world - more than a million dollars. But Gilbey projects an overall loss of about $6 million. That meant layoffs, but jobs will slowly return as the guests do. Esalen Events Coordinator Katie Cronen says they don’t want to get ahead of themselves. “So we are taking it slow and I think we’re planning to be at about half or a third of the capacity for the remainder of 2017,” Cronen said. Esalen is still recovering. And it’s still isolated since you can’t drive through on Highway 1. The only ways its guests can get there are by hiking around the downed bridge or taking a shuttle over Nacimiento-Fergusson Road. A shuttle service launches in Big Sur Saturday, July 1st. It will give visitors a way to access businesses on the south side of the downed Pfeiffer Canyon Bridge, an area locals call “the island”. Rush hour in Big Sur, Calif., has taken on a whole new meaning. Most mornings and afternoons, a newly built footpath that plunges through a grove of towering redwoods is clogged with workers and schoolchildren. That hiking trail is a lifeline. It circumnavigates a bridge on the Pacific Coast Highway that has been closed since February, after it collapsed from rain and mudslides. Without that path, much of the village of Big Sur would be cut off from the outside world. At the Big Sur River Inn, outdoor umbrellas and dining tables sit on the decks waiting for visitors. It’s spring break, a time of year when the restaurant would normally be busy and the rooms here booked. But both are virtually empty.